Testimonial | Jill Murray, Pennington, NJ | 1-800-GOT-MOLD? "I am very happy to put my recommendation for Jason Earle and Oreo in writing as I have already referred numerous friends and family members. I am also going to forward this letter to our family sinus doctor, Dr. Scott Kay, a well-known and well-respected ENT in Princeton. Our family had a nightmare mold problem (like you would see on 60 Minutes) and we had to move out of our house and live with my parents for a year. Our daughter, then 3 1/2, had been chronically ill for 2 1/2 years. Up to that point, hundreds of tests on our daughter brought no answers. Instead of dissecting Caitlin, we should have ripped apart our house. I was dismissed by more than 40 doctors every time I brought up the possibility of an environmental problem. I only wish I had met Jason and Oreo back then. It would have saved so many headaches – mostly my daughter’s. Fortunately I took Caitlin to Dr. Kay for her untreated, horrid sinus infections. He noted that a trigger like mold can do such damage, especially if a person is allergic. After a full year of 100% perfect health, our brand new house was built and we moved out of my parent's home. To my horror, Caitlin's problems started again. After a near nervous breakdown and six months into the new house, I found Jason Earle and Oreo. Dr. Kay mentioned that he had seen a mold-sniffing dog on Channel 6 Action News but he didn't know anything about him (yet). We tracked them down and got their number through the internet. I called him immediately and left a message. Jason called me back immediately. He gave me about 30 minutes of his time listening intently. He gave me websites to download mold related information from medical journals, the EPA and the Mayo Clinic. All of this was very informative. We scheduled an appointment for 4 days later. My skeptical husband was fine with Jason & Oreo because “dogs don't lie” and Jason does not work for a remediation company. Thus he has no reason to sucker us into unnecessary work and/or payments. Jason was on-time and extremely professional. It was incredible to be validated by someone so knowledgeable. He took copious notes as we walked together though my home. Then he and Oreo went though all 7000 square feet of our home. He spent another hour showing me areas of concern. Unfortunately, our new basement stairs were held up with moldy lumber. I had walked past it countless times and never noticed. It was so black with mold that I actually thought it had been painted black. He gave me thorough instructions on how to remove it. In addition he sent a timely letter reiterating this information. Caitlin's health dramatically improved immediately. Then, three months later, out of nowhere, her respiratory nightmare suddenly resurfaced. At or around the same time of her newest flare-up, during a severe rain storm I noticed a pinging sound in our chimney and also noticed that the surrounding carpet was damp. I panicked and called Jason immediately, even before calling my husband. Not sure if this new problem might be a trigger for her recent relapse, I felt it imperative to investigate it immediately without any further delay. Jason & Oreo arrived within hours like a knight in shining armor to confirm my suspicion and determine the solution. Oreo alerted on the sheetrock surrounding the fireplace and the carpet. Jason isolated a roof leak, specifically a flashing problem around the chimney. Our roofer confirmed Jason's diagnosis and made the necessary repairs to prevent a recurrence. The affected carpet and drywall was removed by professionals. The carpet crew later told me that they were out of work for two days with headaches and nausea from the mold exposure. I think they, like most people, underestimated the possible adverse health effects of mold exposure and will probably take further precautions when dealing with similar situations in the future. Nobody is happy to have a mold problem in their home – especially not two. I was, however, relieved to isolate the source of Caitlin's illness and ailments and to be able to rectify and remove it to restore my daughter's health and, at the same time, heal our family. We chose to do the remaining mold remediation ourselves for several reasons. Although it prolonged the process and was not the ideal choice, my husband Brad took care of it while Caitlin and I moved out of the house for a few weeks. We took the opportunity to fly to the Mayo Clinic where they evaluated Caitlin. The doctors there verified her mold-triggered asthmatic condition. At the writing of this letter, Caitlin has been 100% symptom-free for 2 years. 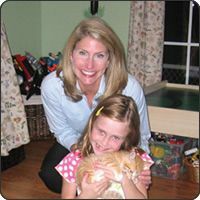 Prior to meeting Jason and Oreo, I had been so traumatized by the fears surrounding Caitlin's health that I was ready to seek therapy. I was so paralyzed by my own fears and feelings of inadequacy as a mother because of my inability to help my baby girl that I felt like I was truly losing my mind. And this is coming from a certified Master of Social Work (MSW); skilled and trained in stress management techniques and strategies. My gut feeling was that there was some environmental trigger that was the underlying cause of her illness and no one was able to confirm that and provide a final solution until we hired Jason Earle, Oreo and Lab Results (now 1-800-GOT-MOLD?) to do what they do best. I now know what we are dealing with. I am so thankful to have found Jason and Oreo. If you are reading this and contemplating hiring 1-800-GOT-MOLD?, take it from me – it is worth every penny to know that your family is safe and healthy in your home."